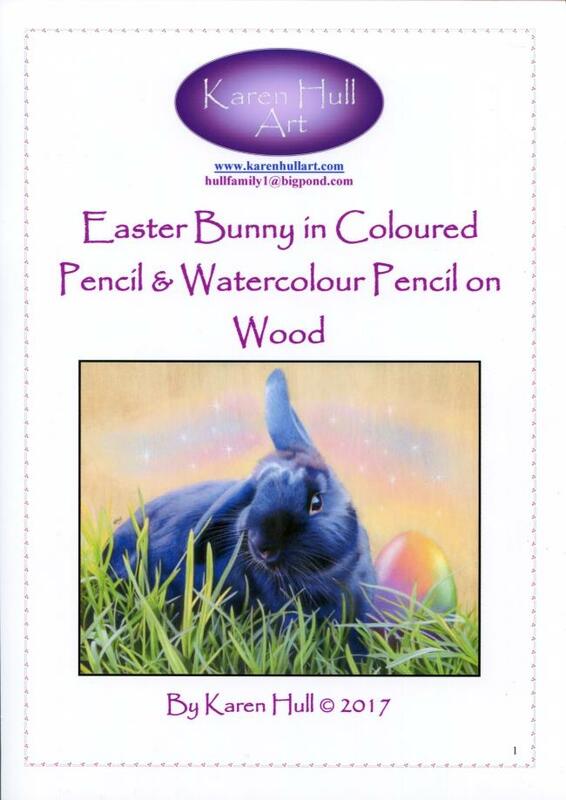 This 30 page step by step tutorial shows you how to create this gorgeous Easter Bunny using coloured pencils and watercoloured pencils on Cradled birch ply. You can also complete this tutorial on regular watercolour paper, watercolour canvas or any surface that is receptive to both watercolour pencils and pencil or, if you prefer, with just the wax and oil based pencils alone. The watercolour pencils simply speed the process up for you. This tutorial was created using Polychromos, Pablos, Luminance and Verithins along and if you don't have these brands of pencils then you might find the Coloured Pencil Conversion charts assist you in working out which pencils to substitute. The watercolour pencils used are the Caran D'ache Museum Aquarelles. There are also Watercolour Pencil Conversion Charts that will assist you in converting colours when working with other brands. The sky has been created using Pan Pastels in four different colours but this is an optional part of the tutorial. These tutorials are created without the expectation that you need to go and buy a lot of extra art materials but rather adapt and work with the materials you already have.